Lightly spray molds with non-stick cooking spray. Wipe each cavity with a paper towel. This will leave just enough residue to help pop the shots out once they are set without affecting the taste. Pour water and coconut milk into a small saucepan and sprinkle with gelatin. Allow to soak in for a minute or two. Add sugar and heat until gelatin and sugar have dissolved, stirring occasionally. Remove from heat, and stir in the alcohols. Pour mixture into molds, only filling halfway. Cover the remaining gelatin mixture and leave at room temperature. Place shots in refrigerator and allow them to set for 30 minutes. When you touch the surface with your finger, gelatin should be lightly set and no longer liquid on the surface. Spoon about a teaspoon of preserves onto each shot, making sure not to allow the jam to touch the edges. If remaining gelatin mixture has separated, stir and pour on top of the preserves, filling to the top. Return shots to refrigerator and allow to set 4 hours or overnight. When ready to serve, gently separate the shots from the edge of the molds and turn out onto a serving platter. Garnish platter with additional preserves and add red food coloring to the veins of the brains using a toothpick. Thanks to the 80’s horror flick, Return of the Living Dead, we know that zombies like to feast on human brains. So what better way to booze up your Halloween get-together than with some zombie snacks for your undead partygoers? We saw this idea over at Wikihow and thought it'd be perfect for eerie entertaining! They take the term "jelly shot" to a whole new level with a slimy surprise in the middle. Trick or Treat? How about both! The Tablespoon twist on this recipe uses coconut milk for the white base of the brains. By using a cream-based liquor in addition to the vodka, it will give them a slightly ghoulish gray color. And Cascadian Farms organic fruit spread provides a delicious and slimy surprise in the middle of these boozy bites. Lightly spray molds with non-stick cooking spray. Wipe each cavity with a paper towel. This will leave just enough residue to help pop the shots out once they are set, without affecting the taste. Pour water and coconut milk into a small saucepan and sprinkle with gelatin. Allow to soak in for a minute or two. If you prefer a more firm shot, or if they will be sitting out awhile, I recommend using 3 packets of gelatin. Otherwise, 2 or 2.5 packets should be fine. Add sugar and heat until gelatin and sugar have dissolved, stirring occasionally. Remove from heat, and stir in the alcohols. I find it easiest to place the molds onto a sheet pan to stabilize them, and for easier transferring in and out of the fridge. (It also cuts down on possible drip mess in your fridge!) It's also helpful to transfer the mixture to something with a pour spout, such as a measuring cup. Pour the mixture into molds, only filling halfway. Cover the remaining gelatin mixture and leave at room temperature. Place shots in refrigerator and allow them to set for 30 minutes. When you touch the surface with your finger, the gelatin should be lightly set and no longer liquid on the surface. Spoon about a teaspoon of preserves onto each shot, making sure not to let the jam touch the edges. If the remaining gelatin mixture has separated, stir and pour on top of the preserves, filling all the way to the top. Return shots to refrigerator and allow to set 4 hours, or overnight. When ready to serve, gently separate the shots from the edge of the molds and turn out onto a serving platter. 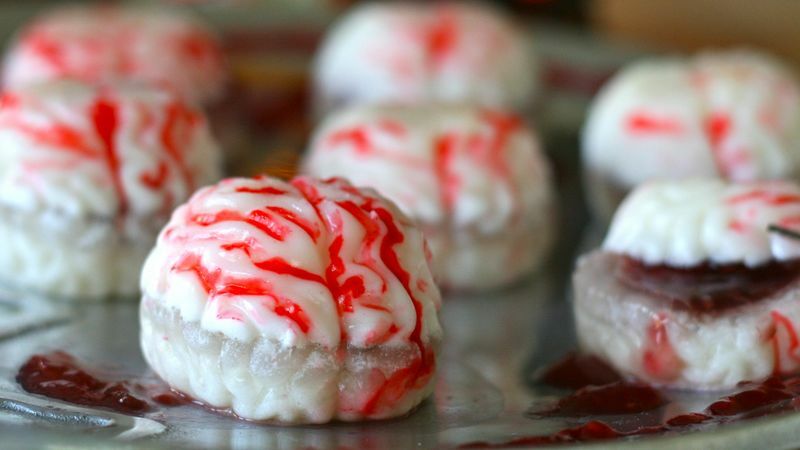 For an even more realistic effect, add red food coloring to the “veins” of the brains using a toothpick and garnish the platter with more preserves. Your guests will be screaming for more of these spooky snacks in no time!